This is not a sponsored post.I just thought this would be a useful item for some of you. I opted not to receive payment or product. Sponsor will mail prize. If you are traveling and you have a little one, you know that one thing you don't want to use to wash out baby bottles or toddler food dishes, is the bathroom sink. I mean just thinking of the germs is enough to send one packing up and running home. What can help? 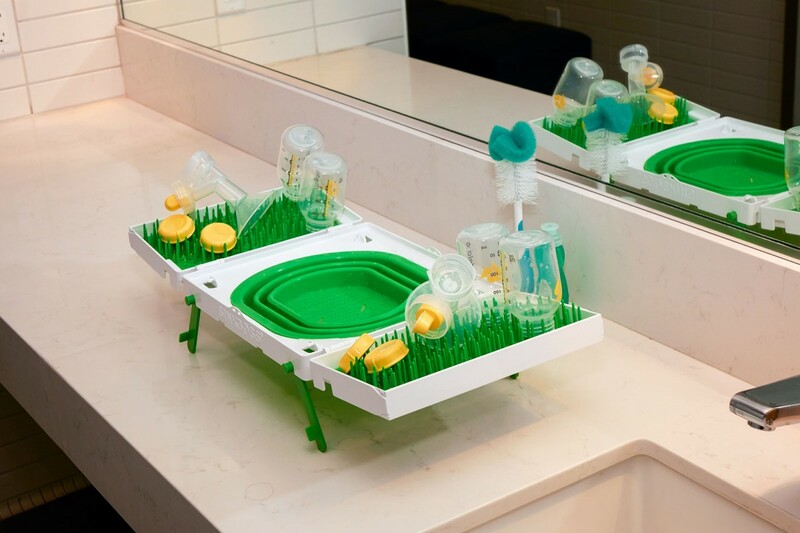 SinkBoss is a portable dish washing area that stands alone to dry, or can be suspended from a rack (such as shower curtain, towel rack, etc.). It helps keep baby items away from icky sinks with who knows what germs in them, and helps give parents peace of mind. It is also extremely portable, as it was designed with travel in mind. I'm supposing my daughter will like one of these when she's traveling with her little one soon. She's already germophobic when it comes to conversations about her daughter, saying things like when she's born she doesn't want strangers touching her child, or anyone kissing her on the face (she read an article somewhere about babies getting very sick or dying from it). I'm sure she'll kiss her on the face, but she's mom...and I'm sure dad will be all about the kisses too. The rest of us will be considerate and refrain, because we respect her wishes and we know the time will be here soon enough where we can plant all of the kisses we want on little fat cheekers. :) My point is, if she's that concerned (and good for her) with germs, this item, once she hears about it, is probably going to be top on her list of travel wants, and who could blame her. I think it's a wonderful invention. If you think so too, be sure to tell a friend! You can learn more about it by visiting the SinkBoss website. You can also enter to win one below. US entrants only. and the potentially contaminated sink basin. That is so awesome! I wish this had been around when my kids were babies. I would have definitely used it. I gotta get one! My baby girl is almost 2, and I definitely need this. Looks sweet! Perfect indeed. Wise of her to keep all the germs to a minimum too. If it has to do with babies, then I'm in. Cool giveaway. That is all kinds of awesome. I seriously wish I had this when my boys were little. This product looks great! I wish I had something like this for our last trip when we stayed in a hotel! I like that it is a wash and dry with the same thing. I learned that Sinkboss is a Mom’s Choice Awards® Gold Recipient! Where was this when our son was little?! There are so many convenient products like this that are out now for families. Believe it, or not my sister still has to deal with feeding parts and always will for Emerson. He takes food now, but it's through a tube. All the parts have to be cleaned each and every time. I like that they have a hook and strap system that will allow you to suspend it from an overhead area. I learned that if you don't have counter space you can hang it! Sink Boss has pull-out legs. Sinkboss is a Mom’s Choice Awards® Gold Recipient. What a fantastic idea for traveling and camping. I like that it's portable and lightweight! I love how this is light weight! This would be so awesome! It is like having a portable separate sink for my granddaughter's stuff so her bottles don't get contaminated by my sink contents! They also offer a 15% discount that you can use immediately! I like the fact that "Sinkboss: Portable, Lightweight and Compact." I like that it has pull out legs.